2. Parboil the potatoes in boiling water for 10 minutes, drain and transfer to a roasting tin. Crush the potatoes lightly with a masher. Add the oil, garlic and rosemary, and stir to coat the potatoes evenly. Season. Roast for20 minutes until crispy and golden. 3. Meanwhile, place the bacon under a preheated grill for 5 minutes, turning once until crispy. Then slice and set aside. 4. 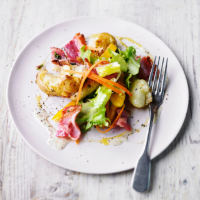 Toss the salad in the dressing with the bacon and warm potatoes to coat evenly.